story by Samantha WittchenFACT: It takes approximately 5,000 pairs of sneakers to create an elementary school playground surface. PROBLEM: The average lifespan for sneakers is 500 miles. For most people, that means replacing their sneakers every six months to a year, which results in somewhere between 300 and 600 million pairs of sneakers destined for the landfill annually. But don’t chuck your Chucks yet, because they can be recycled into playground surfaces, running tracks, basketball courts, carpet underlayment and, yes, even new sneakers. SOLUTION: Rittenhouse Sports (1717 Chestnut St., 215.569.9957) accepts used sneakers and shoes, and donates footwear in decent condition to homeless shelters. The remainder are recycled. Philadelphia Runner also accepts sneakers at their Center City location (1601 Sansom St., 215.972.8333). They only ask that you don’t tie the laces together when donating your worn-out kicks. 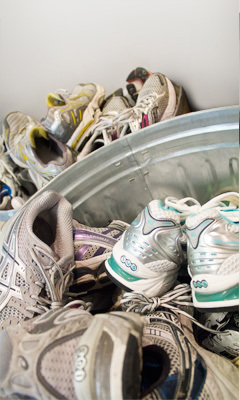 The Nike Reuse-A-Shoe program is available at most Nike and Converse Factory Stores, including the ones at the Franklin Mills Mall in Northeast Philadelphia and the Philadelphia Premium Outlets in Pottstown, Pa.